Meets all federal & provincial requirements. Designed for transport drivers, shippers, receivers. Focus on classification, reporting, & safe handling. Canadian law requires that anyone involved in shipping, handling, or transporting dangerous goods must be trained in Transport Canada’s safety standards. This comprehensive TDG Online Training Course is fully compliant with Transport Canada’s Transportation of Dangerous Goods Act and will fully prepare you to carry out your responsibilities. All employers are required to ensure employees are fully trained in TDG regulations and that their certification is up to date. TDG certification is good for 36 months (3 years). NOTE: TDG training certification is non-transferable. New hires MUST re-certify whenever they begin work with a new employer. John O. Verified Buyer The material was relevant and comprehensive. It was a simple and effective way of getting our staff compliant. Leslie G. Verified Buyer Thank you for providing a very comprehensive e-learning product. I was able to hear, read and apply the material as I progressed. Theresa B. Verified Buyer I found the website and course was very easy to understand & navigate through. I learn something every time I do this course. Darren W. Verified Buyer Easy to use, lots of extra info, customer service is top notch. Gurpal S. Verified Buyer I don’t haul DG very often but this course has refreshed my knowledge on it. Print your TDG training certificate and permanent record of training immediately upon successful completion of this course. Hard copy plastic versions are available upon request. TDG online training can be completed at your own pace, in about 3 hours in total. There is no time limit. Exam attempts are unlimited. Access live student support from our TDG subject matter experts 7 days/week via phone, email, and live chat. Individual training and bulk user management tools include: progress reporting, access to past records of training and certificates, certification reporting/alerts, and much more. Upon completion of the final exam, a digital certificate will be issued immediately. This certificate can be downloaded from your account and printed at any time. As per regulations, your certificate must include your employer’s name and address, and be signed by both yourself and your employer. In the case of self-employment: if you believe on reasonable grounds that you are adequately trained to perform your duties, as a self-employed person you may sign as both the trainee and the employer. Physical certificates may also be ordered for an additional fee. Your record of training will be stored securely in your account should you need to reference it or provide proof of training. The record includes training details, completion date, and expiration/renewal date. Add, modify, and remove as many users as you require. View training records, print certificates, and report on user progress. Distribution of training programs can also be automated using enrolment codes. Track certification status for your users including issue dates, completion status, and upcoming renewals. The certification management tools also allow you to create and assign custom certifications for third-party courses, on-site practical training, or previously completed training. Track all of your user’s training in one place at no additional cost. WHAT TOPICS ARE COVERED IN THE TRANSPORTATION OF DANGEROUS GOODS - GROUND COURSE? WHO IS REQUIRED TO HAVE TDG - GROUND TRAINING? Anyone who handles, offers for transport, or transports dangerous goods, or supervises workers involved in these roles. Workers who load and unload dangerous goods. HOW LONG IS MY TRANSPORTATION OF DANGEROUS GOODS CERTIFICATION VALID? The TDG training certificate expires 36 months (3 years) after the date of issue. You are also required to re-certify if you change employers, or if TDG regulations or training requirements are updated. An inspector can request to see your Transportation of Dangerous Goods training certificate for up to two years after your certification has expired, so it’s important to keep a hard copy on hand. You can print your certificate directly from your user account or request a wallet-sized, hard copy plastic versions directly from Go Safety. These are perfect to keep with paperwork in case of an inspection. HOW LONG DO I HAVE TO COMPLETE MY TDG TRAINING? Most students will complete the TDG By Ground course in approximately 3 hours, but there is no time limit to finish your studies. You can pause the training program and pick up where you left off later. Take as long as you need. Once completed, the training material will continue to be accessible to you for review purposes. You can write the exam multiple times until you achieve the passing grade of 80%. WILL THE TRANSPORTATION OF DANGEROUS GOODS TRAINING PROGRAM WORK ON MY TABLET OR SMARTPHONE? Yes! Go Safety’s TDG By Ground course has been developed to work on all major operating systems and web browsers. Your training may be taken on a personal computer/laptop, as well as most tablets and mobile phones. When you begin or continue your training on a mobile device the website/application controls, and interface will automatically adjust for your screen size and optimize the controls for your device. In the event of an interruption due to loss of connectivity, your training will be paused. You may resume your training at any time by logging back into your account on any compatible device with an internet connection. Alternatively, offline training manuals may be used to self-certify. HOW CAN I ACCESS MY TRANSPORTATION OF DANGEROUS GOODS - GROUND RECORD OF TRAINING? Your TDG – Ground record of training is made available from your user account. This record is maintained by Go Safety for a minimum of five years and is available at any time. NOTE: An inspector can request to see your TDG – Ground certification for up to two years after it has expired. WHAT HAPPENS IF I LOSE MY TDG - GROUND CERTIFICATE? 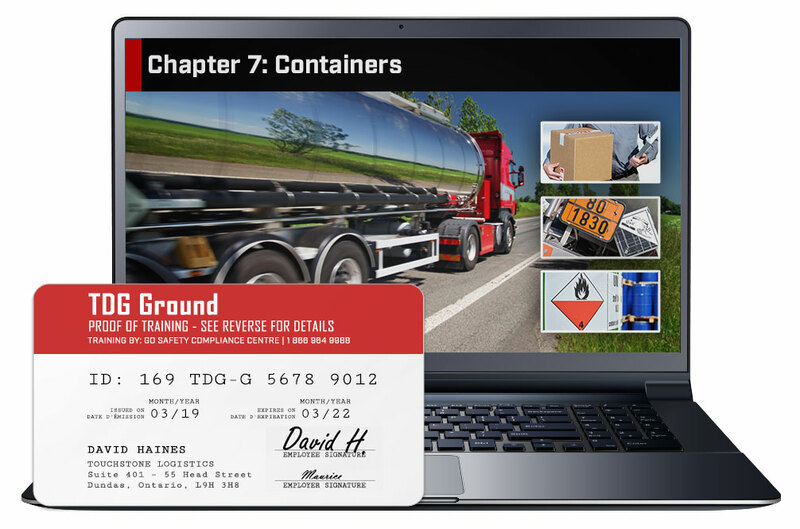 If you lose your Transportation of Dangerous Goods – Ground Training certificate, you can download and print a replacement copy from your account at no cost. If you would like a hard copy replacement delivered via mail or courier, you can order one directly from Go Safety. There will be a small charge to cover the cost of postage, printing, and fulfillment. Please note your name, the name of the course, and completion date in the body of your email.inting, and fulfillment. CAN I PURCHASE TRANSPORTATION OF DANGEROUS GOODS - GROUND TRAINING FOR SOMEONE ELSE? 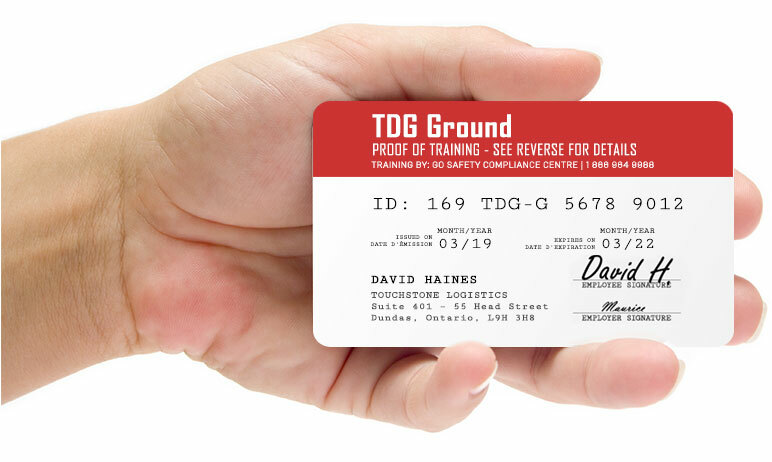 TDG – Ground training can be purchased for others, including workers, students, and friends. Simply purchase the course and then assign it to a new user account after the transaction is complete using the Manage User panel.